Westport's Railroad Place has seen several business closures in the past year. WESTPORT — It’s the last day of February and Sudhkar Rau, a salesperson at Desi’s Corner on Railroad Place, is packing up the remaining inventory in the near-empty convenience store. “It’s very slow. What we used to make, we’re not making, and on top of that the rent is high,” Rau said. 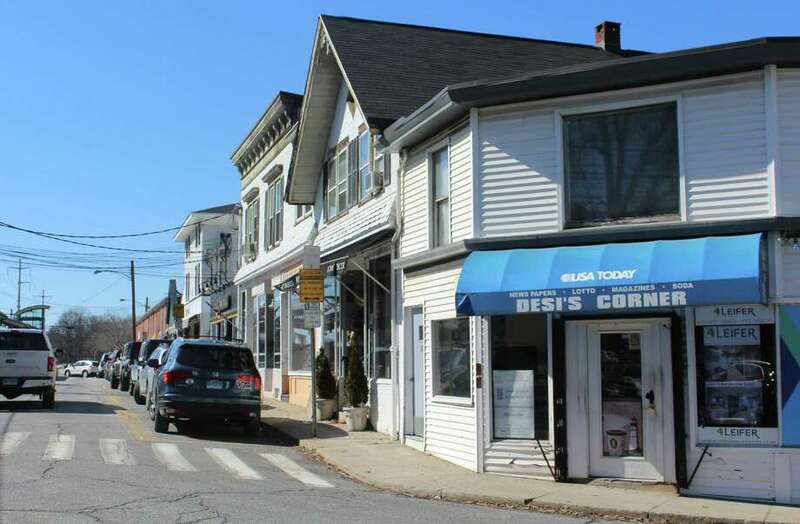 The following day, Desi’s closed its doors after seven decades on Railroad Place, further changing the face of the small street opposite the Saugatuck Train Station where several long-standing shops have shuttered in favor of high-end establishments. Commuter Coffee, a staple of Railroad Place, closed in June after 42 years serving classic diner food to customers on the go and in the shop’s rose colored booths. In 2015, Mario’s Place, an iconic family restaurant, folded following a half-century in business on the street. The expected arrival of Mystic Market, a gourmet eatery that opened in February just around the corner from Commuter Coffee’s former location, influenced his decision to close the shop, Whelan said. A new shop has yet to replace Commuter Coffee in its old spot, but the remaining storefronts are near fully-populated, mostly with high-end furniture and gift shops and restaurants, in addition to a hair salon and sports store. But not all Railroad Place closures can be attributed to changing customer tastes, said Breno Donatti, whose Winfield Street Coffee shop closed the same week as Desi’s. Donatti, who also owns Winfield Street Italian Deli in downtown Westport and a Winfield Street Coffee shop in Hudson, N.Y., and another soon to open in Stamford, said a shift in the landlord on Railroad Place spurred his leave. “It was really a hostile takeover of the building,” Donatti said of the transfer in ownership of Hanes Realty Corporation, which owns most of the real estate on Railroad Place, from the Girden family to Shepard family. The buildings on Railroad Place have been in his family for over 110 years, ever since his grandfather started the Saugatuck Grain and Supply Company in 1911 on Railroad Place, Steve Girden said. Later, his grandfather acquired several properties on the street before forming the Hanes Realty Corproation in 1952. Girden’s mother had one sister, whose children and Girden’s cousins — the Shepards — have run Hanes Realty for the last two years. “It’s a private negotiation between two sides of the family,” Girden said of the dispute between his siblings and the Shepard brothers, adding he could not speak further about the negotiation for legal reasons. Jon Shepard, who is listed as vice president and secretary of Hanes on the Secreatry of the State’s website along with his two brothers who serve as president and treasurer, would not comment on the circumstances surrounding his acquisition of the company. Shepard is unresponsive to tenant needs, Donatti said, alleging Shepard exploited a clause in his lease to deny Winfield a lease renewal. “We were willing to pay more; they just didn’t offer us to re-sign,” Donatti said. One other Railroad Place tenant who wished to remain anonymous also cited the Shepard family’s management was not receptive to tenant needs. The greatest challenge to business, however, is running a small shop in an economy unfriendly to brick-and-mortar retail, said Mersene Norbom, owner of the Railroad Place gift shop Indulge by Mersene. “It’s difficult to stay afloat if you’re not a chain,” said Norbom, whose shop opened in 2012. The prevalence of pricey shops on Railroad Place is a sharp divergence from the old-time shops symbolic of the neighborhood’s traditional working-class identity. Starting in the early 1900s, Italian immigrants settled in Saugatuck to be close to the river, railroad and all the oil and work that came in through the Long Island Sound, Saugatuck Sweets owner Chris Diguidio said in a 2017 interview. For some Railroad Place customers, the changes on the street are bittersweet. “It’s an inconvenience because there’s nowhere else around to get coffee and cigarettes and stuff like that besides the gas station,” said Zony Bruany, a frequent Desi’s customer who was in the shop the day before it closed. The new Mystic Market, nonetheless, is phenomenal Bruany added, noting he has been going to the market to eat every day. “I think it’s a shame to see so many businesses closing on Railroad Place at a time when things have turned around so much in Saugatuck,” said Matthew Mandell, executive director and president of the Westport-Weston Chamber of Commerce. Others like Brian Rosenchein, the head chef at Romanacci Pizza Bar, are more optimistic. Romanacci’s took over the adjacent Winfield Coffee location when it closed and will continue to sell coffee at the location, Rosenchein said. “We are revitalizing this area,” he said.